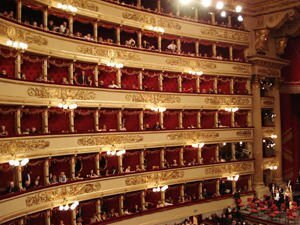 Any visit to Italy will not be fully complete, if you do not visit Milan La Scala. This world famous Opera House is adjacent to the cathedral and ensures a supreme experience if you visit any of the represented at the opera. The official name is Teatro Alla Scala, and to describe the interior is truly a challenge as words can hardly describe it. It is upholstered in red velvet chairs, huge beautiful chandeliers and is very plush as they surround everywhere. It must be seen to feel the unique atmosphere that they create. La Scala was built between 1776-1778, the project was awarded to the popular neoclassical architect Giuseppe Piermarini, who began working at the direction of Austrian Empress Maria Theresia. In 1776 Reggio Teatro Dukale was destroyed and the new theater was built at the church of Santa Maria Della Scala, hence the very name of the famous theater. The first performance, exported in La Scala's was on August 3rd, 1778 with the staging of the opera by Antonio Salieri "grateful Europe" ("Europa riconosciuta"). It is amazing how in less than two years, this elegant neoclassical building was erected and open for visitors. Even today Italy holds first place among all the world for analogues of opera theaters. The beautiful La Scala is 100 meters long and its width is about 38 m. Initially the center of the facade has stood portal where Karelians are spirals. The total capacity is of 2200 theater seats, the number of the boxes is 155, including the kings and it is arranged on four floors. The seats on the ground floor are 678, and the first and second balcony has 409 seats. White, silver and gold tones predominate in the hall of the opera, as it holds impeccable acoustics. The scene itself is not very large. Ground floor in the initial period was not equipped for spectators, but during the performances chairs were placed. As for the lighting of the boxes candles were used that sat on the ground floor. During World War II the theater in Italy was destroyed by bombing and was rebuilt in its original form in 1946, then the building was restored several times, the last renovation began in 2000 and was completed in 2004. For visitors there you have to visit the dining room of Santa Maria della Grazia, which is where the the famous "Last Supper" of Leonardo da Vinci was.